Not much to report in this update, really. I finished off my Haramaki Zensenbutai (the box, I’ve still got the blister with the model armed with the missile launcher to do) and had intended to knock off my remaining two Special Project Karakuri as well, but I didn’t. Otherwise I’ve mostly been writing tabletop RPG things. I’ve written three Shadowrun 5e runs in the past couple of weeks, they’re pretty much complete. We also had our second D&D 5e session on the weekend and we all agreed it was the best D&D session we’d had in a long time (possibly even better than the two Warhammer Fantasy RP sessions we’ve done recently) and I’ve been working on that campaign following the session. I shan’t recap the session here, but I might consider putting up some D&D related things at some point. Above we have all four Haramaki side by side, in the order they appear on the box art. I touched up the first model a little after posting images of her in my last post following a realisation that the piping on the models actually covers the sides of their stomachs. And here we have close ups of models 2, 3 and 4. I’m pretty pleased with how they all turned out. I’m still not convinced they’re my best work, but they do look good on the table and they are painted with a very simple colour scheme. 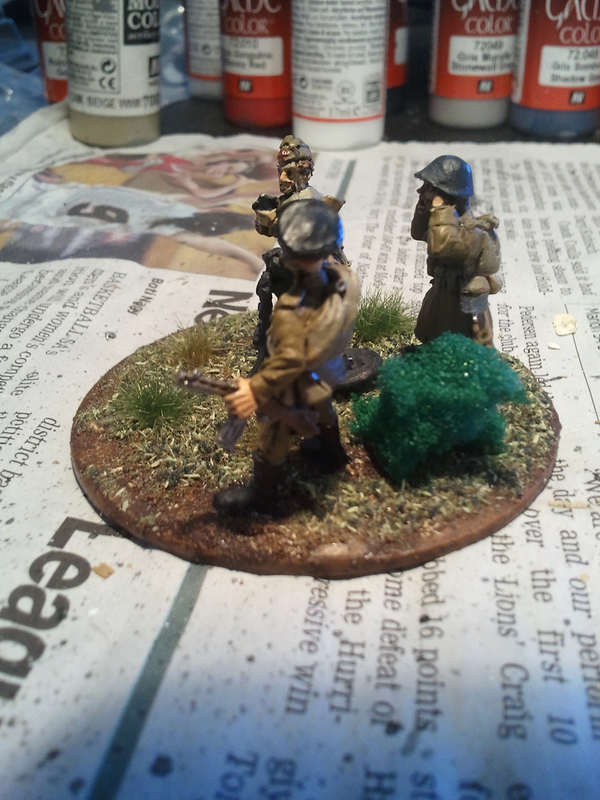 Pants are German Grey over which I painted German Field Grey. Armour is Dead White, red bits (helmet, inside part of shoulder pads) are Bloody Red, piping on body, arms, back and legs is watered down Black over the White Primer basecoat. Not really much more to say today. 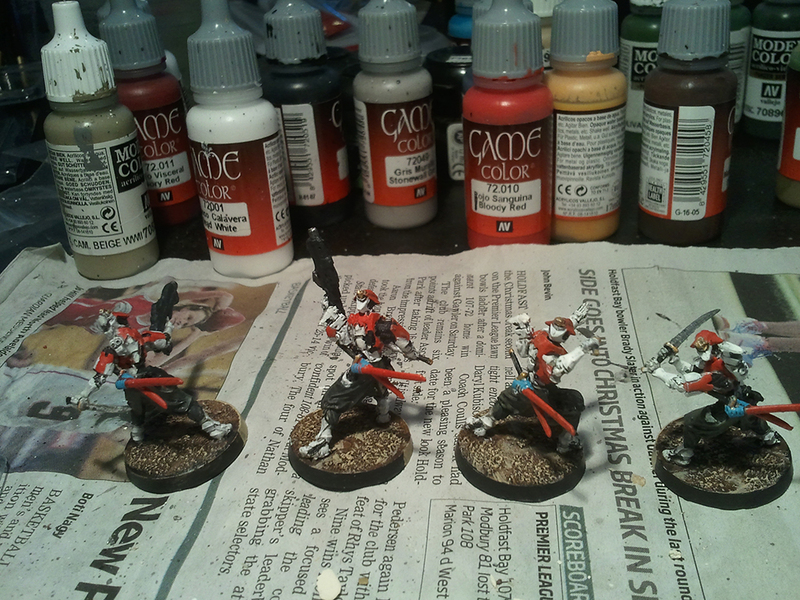 I’ve still got a pile of miniatures to paint, the remaining two Special Project Karakuri being the next in line. I’ve also got a few more models for my Ariadna on the way, when they arrive I doubt I’ll be purchasing any more Infinity models for quite some time, new releases not withstanding. As much as I’d like to get some more Infinity terrain done, my lack of shelving in the garage means I’m flat out of storage space. So until I’ve got that sorted (best case scenario, two to three weeks, I shan’t hold my breath), I’m not keen to commit to any work for lack of a place to put it. When the shelving is done though, I’m actually more interested in getting my Flames of War North Africa terrain done and finishing a full 1800×1200 worth of terrain for Bolt Action. It’s been a while since I’ve done a Friday post, but we’re back! With painted things! Not really much to say this time round. 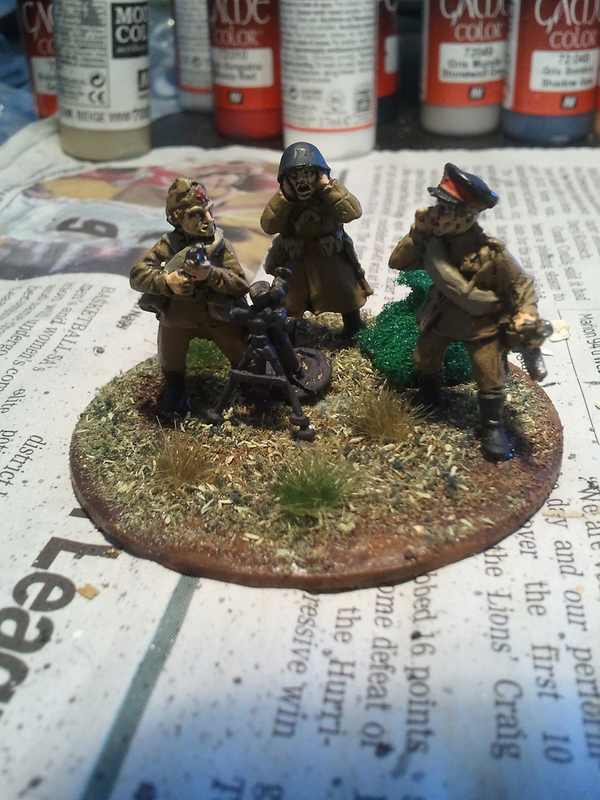 Over the past couple of weeks since my last post I’ve painted a couple of models for my JSA and finally got around to painting the thee Soviet blisters I bought for Bolt Action: officers and medic; Maxim HMG; and an 82mm mortar. 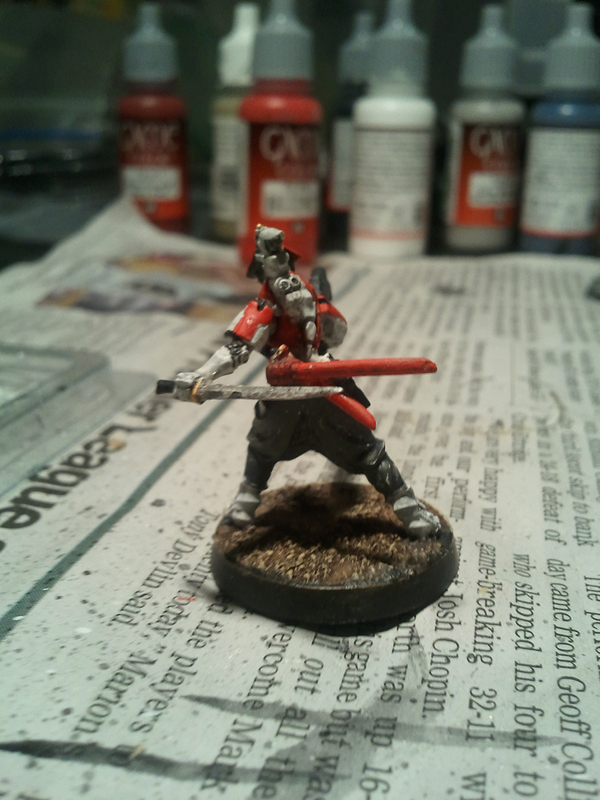 Last Sunday I also played a couple of games of Infinity N3. I shan’t be recounting those two games (I forgot to take pictures of the two tables used), but I can report that adhesive launchers are all of the fun. The photos I took are a bit poor, but if you don’t enlarge them you get the idea. 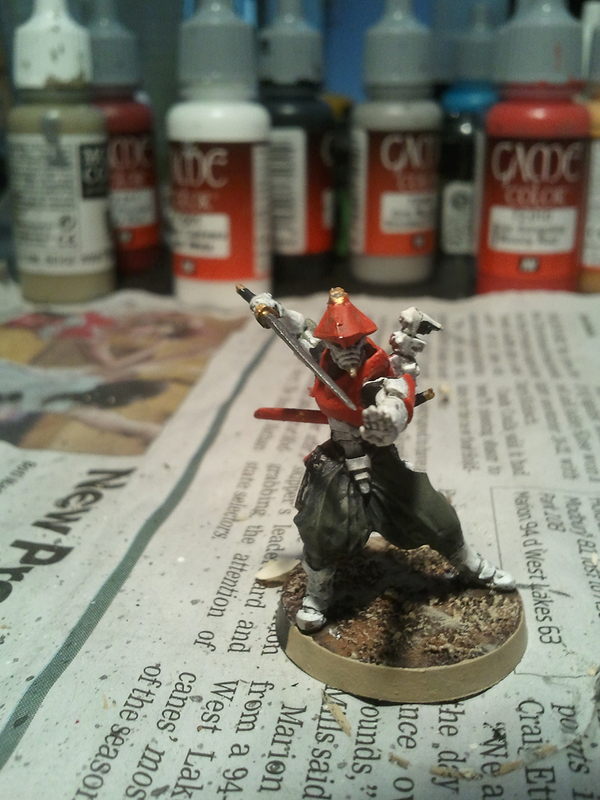 The first of my Haramaki Zensenbutai, I believe she’s the model with the contender. 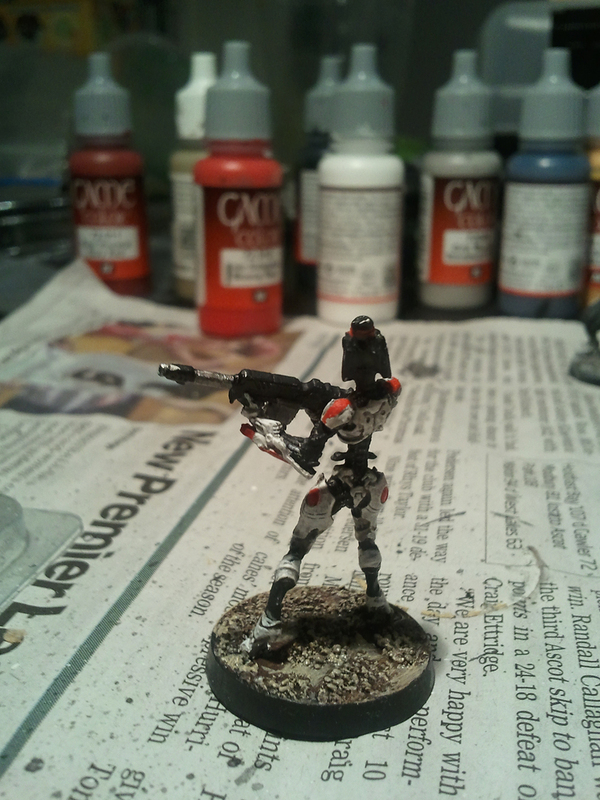 The photos aren’t the best, but she’s a good example that Infinity miniatures don’t need fancy paint jobs to look nice. 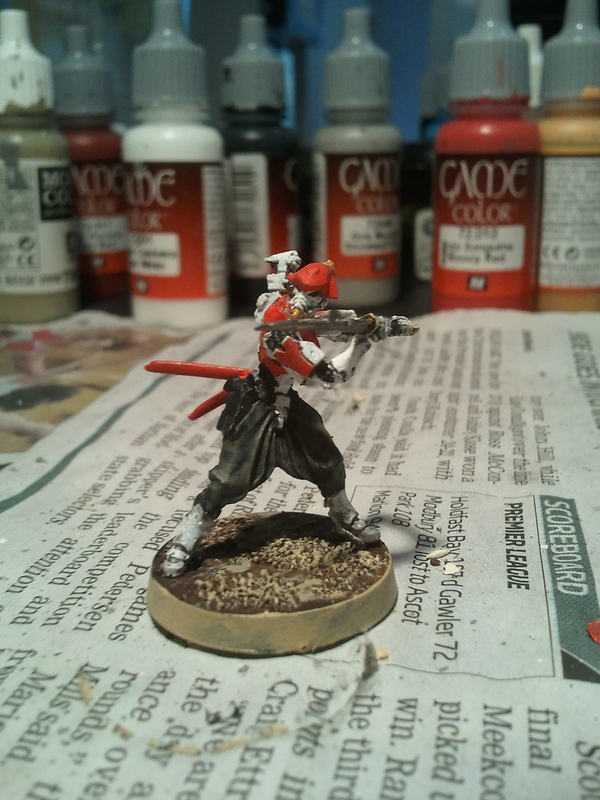 Simple colour schemes and basic techniques will net you nice looking miniatures that look good on the table. 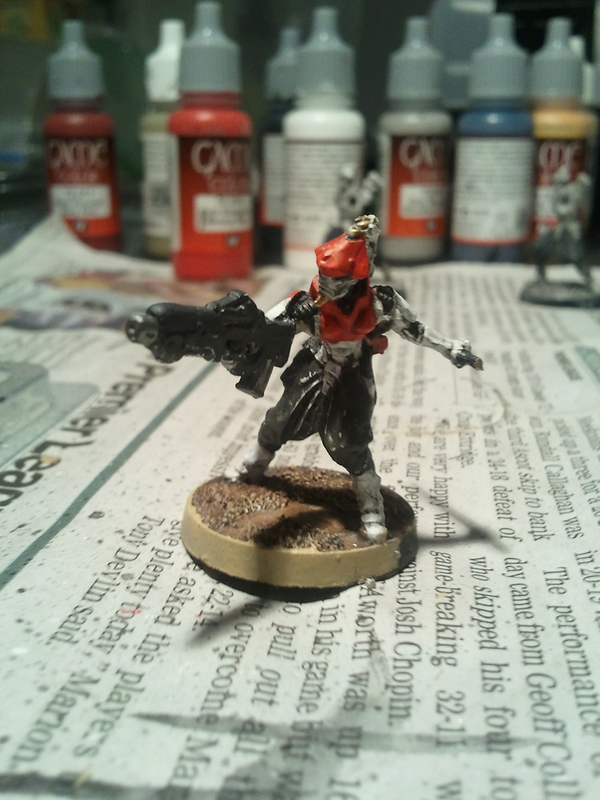 It’s my standard JSA scheme: German Grey pants over which I paint German Fieldgrey; Dead White armour; Blood Red shoulder swatches, and in this case helmet and chest plate. 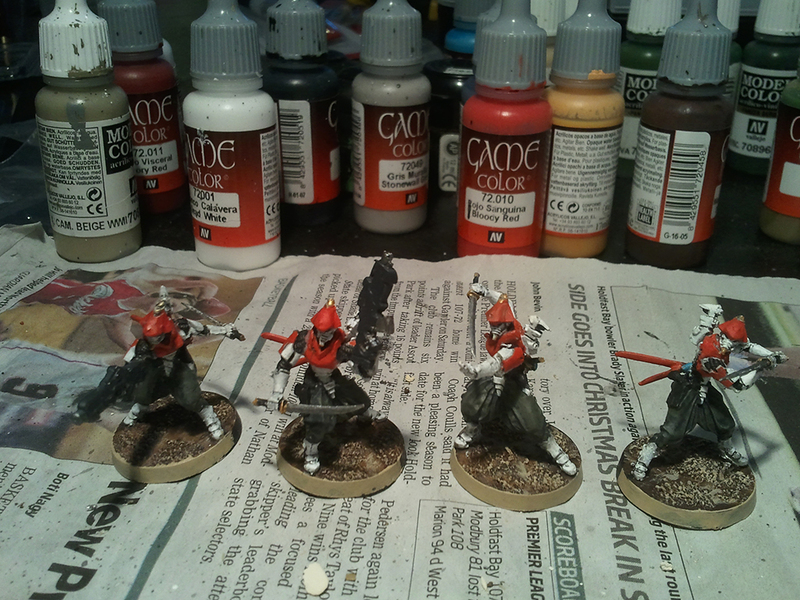 I painted the piping sections (arms, neck, thigh areas) watered down black. The firearm is straight German Grey with Gunmetal Grey barrel and magazine. Pretty straight forward, nothing fancy. And here we have the first of my Karakuri Special Project. This model is armed with an Mk12. These models are pretty ethereal, in that they don’t consist of much. They aren’t fiddly to put together though and you can paint them very quickly. The photos are particularly bad for this model, but it doesn’t look too bad. Colours are even more basic here: Dead White, watered down black and a very small amount of read (shoulder swatches and a swatch in the centre of the chest). 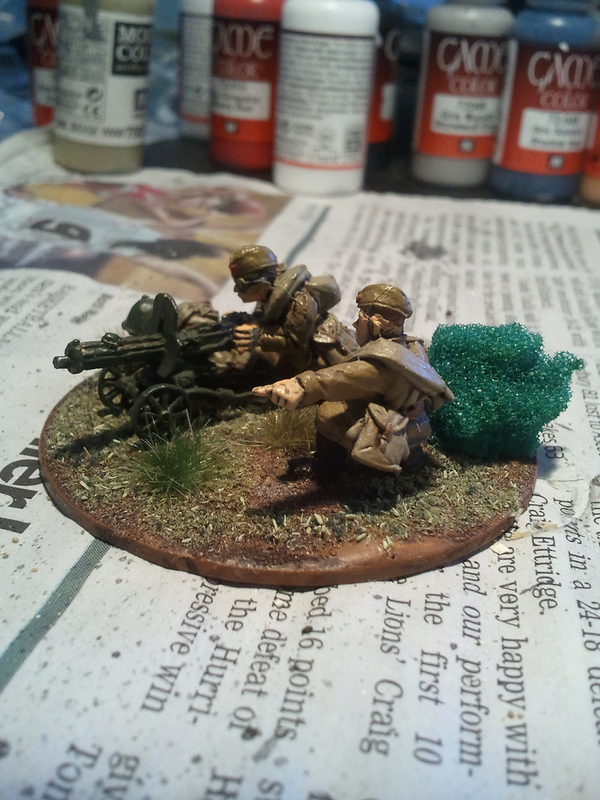 First up we have the Maxim HMG. 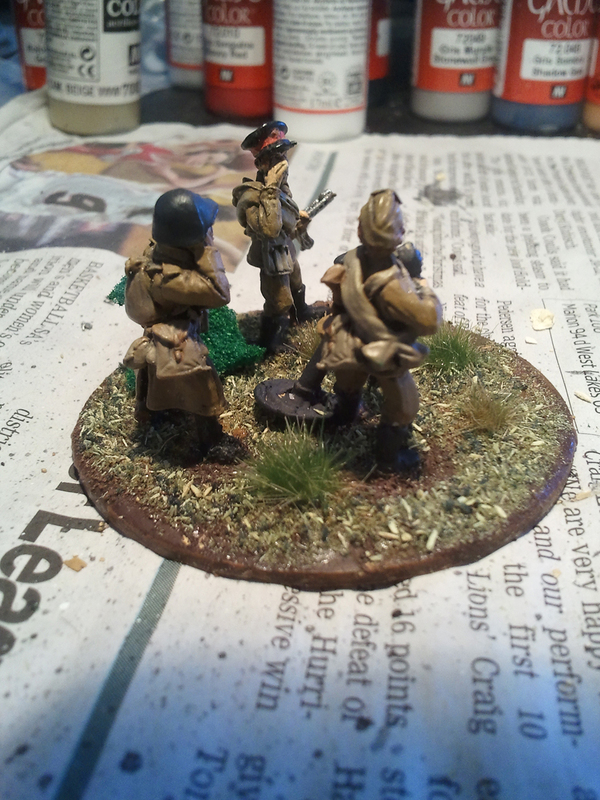 I haven’t painted anything WWII in quite a while, but it always surprises me how easy it is to paint WWII miniatures – or realistic schemes in general. Uniforms are Khaki Grey, belts, tool handles and gun butts Beige Brown, packs and sashes German Camo Beige, helmets and materiel Olive Camo (I believe the colour is now labelled Russian Green). 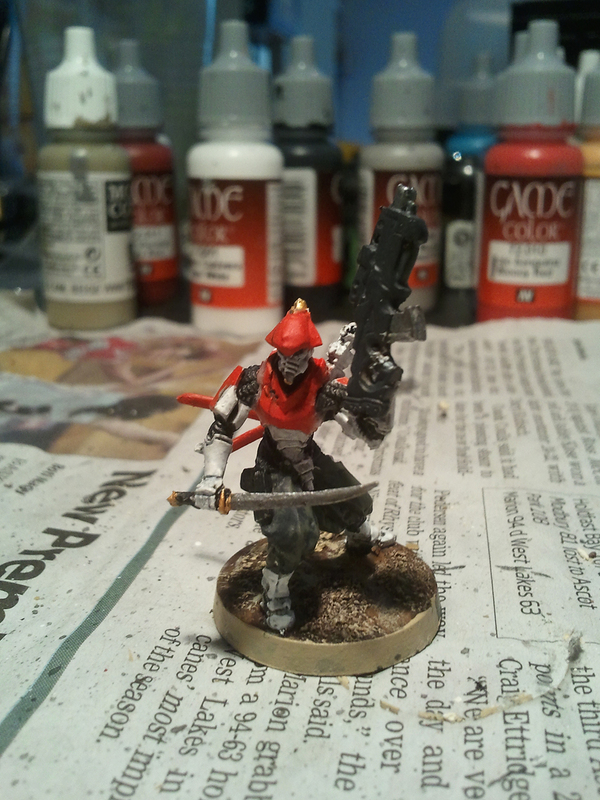 Very simple and straight forward, no highlighting or shading (I rarely do). 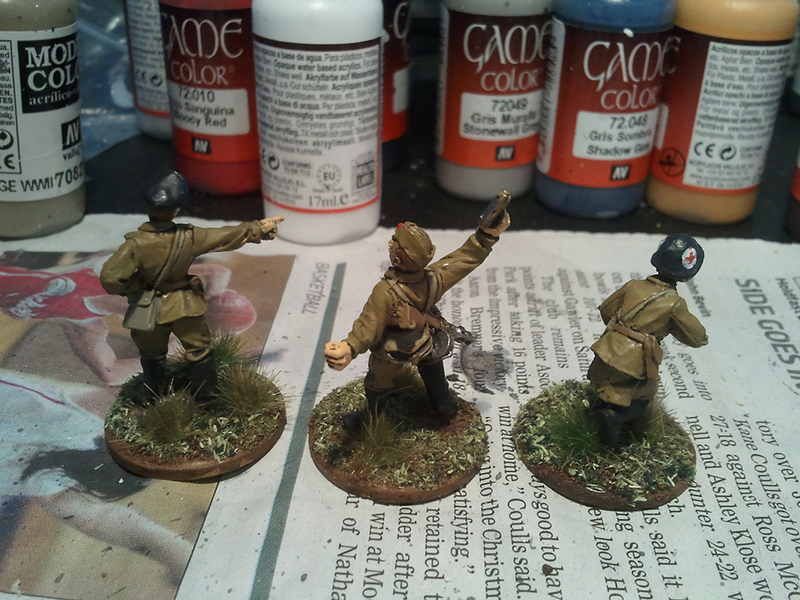 Very happy with the results (as I am with all the Soviet miniatures). 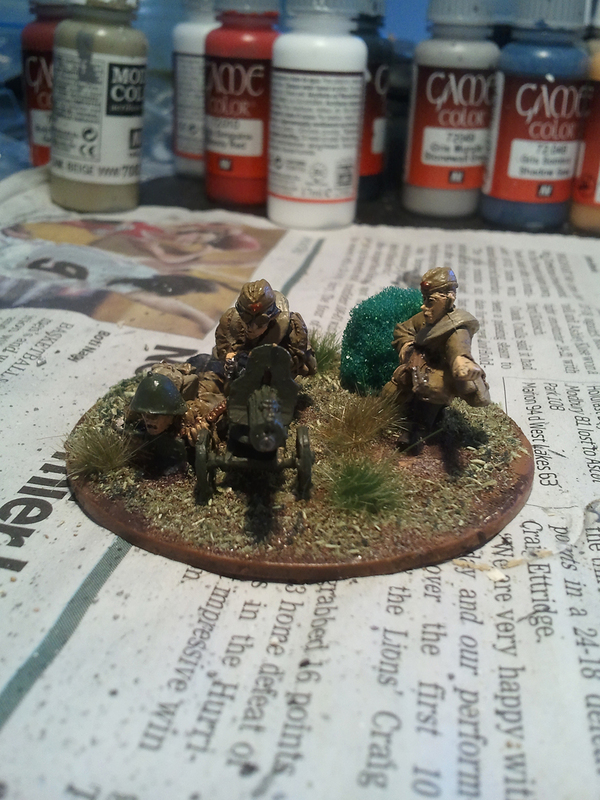 82mm mortar team. Bit of shadow in the first image makes the face on the helmeted guy hard to see. 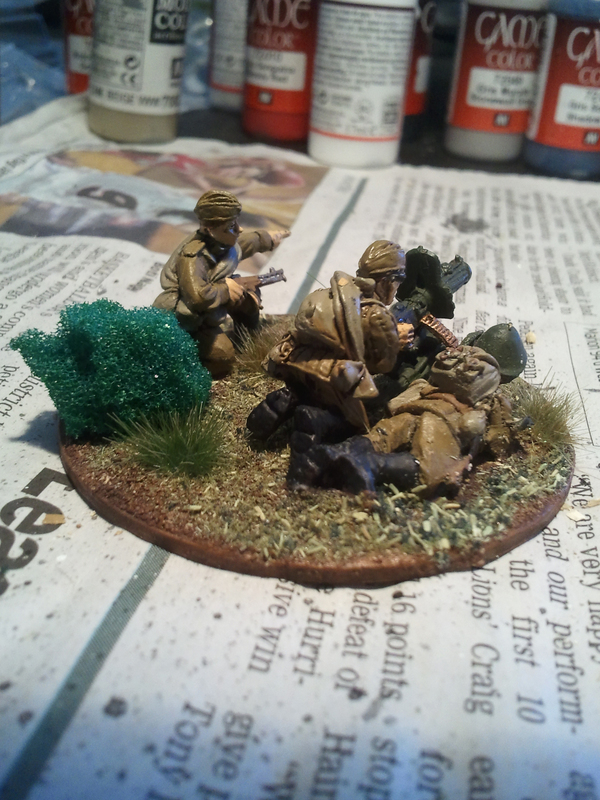 One thing that is different about these miniatures to my Soviet infantry (which you would only have seen in my Bolt Action AAR) is that I undercoated with Dark Yellow (Army Painter) rather than Black. The Dark Yellow is actually very close to Khaki Grey and if you really wanted to you could probably get away with not even painting the uniforms. I wouldn’t advise it though. After undercoated I put a pretty heavy black wash on to make sure all the cracks and crevices are dark so it was as if the model were undercoated black in the sense that when I paint it, if those areas aren’t covered (which the aim is not to), things will look good. If you wash though, you need to paint the uniform to make sure it is a uniform colour (in the sense of consistent). 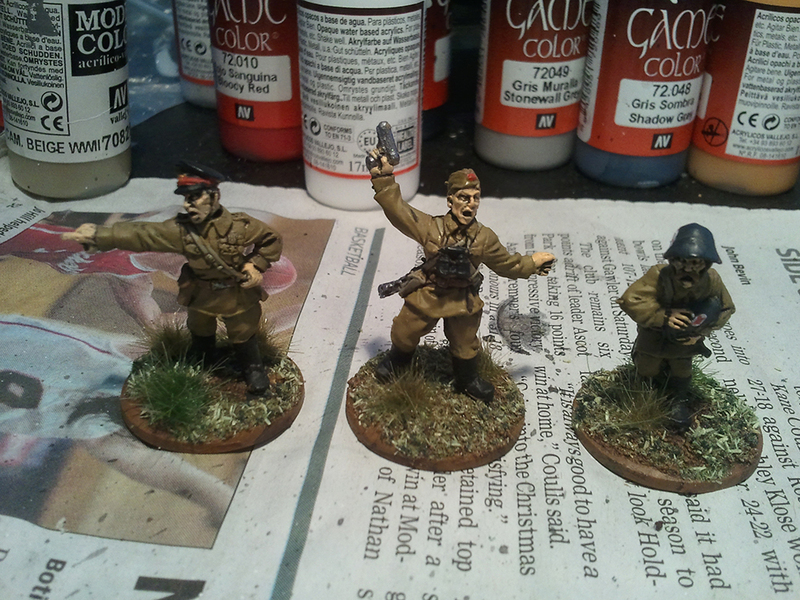 And finally we have the Officers blister: two officer models (one higher ranking than the other) and a medic. I think Warlord do the medic with a white helmet, I didn’t actually check, but absolutely love Olive Camo, so I decided to keep the helmet the normal colour and paint on the red cross. It turned out pretty well and all the models are really cool. So that’s how things have been ticking over for the past couple of weeks. Next up I’ll be painting more Haramaki and Karakuri, probably thinking about getting around to finishing off that Flames of War Terrain I started and grabbing some light grey spray undercoat so I can do the Germans I’ve got. Until next time.